A parklet is a sidewalk extension that provides more space and amenities for people using the street. Parklets are installed in existing street public parking spaces and typically extend out from the sidewalk at the height of the sidewalk in order to expand the usable space. As a pilot program, the CRA wishes to solicit downtown businesses that desire to have a parklet installed in front of their business location. 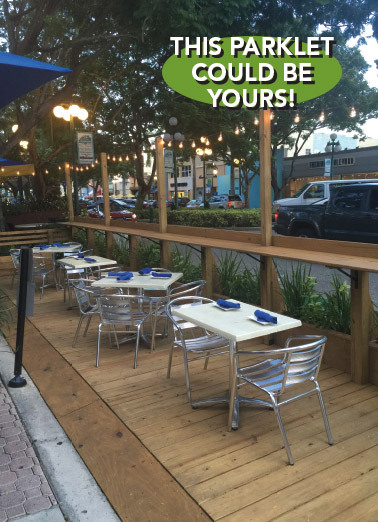 The CRA will construct a parklet at our expense to be installed for a 3-6 month period. The CRA will also reimburse the city for use of the parking space(s) as well as any increase in fee due to expansion of a cafe table permit. There is no cost to the business for this installation. The only obligation for the business is to clean the area in and around the parklet as a part of regular maintenance of the cafe table area. Phase I (approved until May 31, 2019) locations are: Mickey Byrne’s Irish Pub & Restaurant, 1921 Hollywood Boulevard, and The Tipsy Boar, 1906 Harrison Street. Phase II sites TBD by the CRA Board (June 1, 2019 - November 30, 2019).